Do you want to read a book that will have you laughing at witty dialogue one page and sobbing your heart out the next? If you answered yes, then John Green’s, The Fault in Our Stars, is for you. If you answered no then I’m just going to pretend you said yes and recommend you read TFiOS anyway. An amazing novel from a wonderful author who writes about teens for teens. While the ‘teen/young adult’ section of many book stores is quite extensive, there are just some books that stick out amongst the piles of volumes. Green’s novel is one of these, and it’s not just because the cover is bright blue (though that certainly helps). 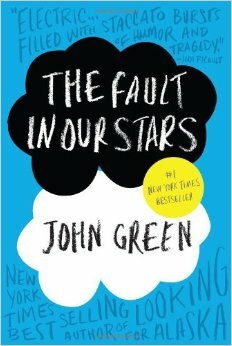 I first heard of John Green through the novel he co-wrote with David Levithan, Will Grayson, Will Grayson. I read this and loved it and knew immediately that I wanted to read more from this brilliant author. Well, when I learned The Fault in Our Stars was going to be made into a film I knew I had to read it beforehand. So I went out and bought it and ended up reading the thing in one night. It was late, I had class the next day, and instead of sleeping I was reading (or trying to, I couldn’t see the words through my tears) this wonderful, fabulous novel. I couldn’t put it down. Green’s novel is one of kind largely due to the characters that inhabit it. The foremost character is Hazel Grace Lancaster, who narrates the novel. Hazel is sixteen years old and has been battling Thyroid Cancer since she was thirteen and is forced to cart around an oxygen tank to help her breathe. She is also forced to attend support group meetings for kids with Cancer and this is where she meets the incredibly charming, Augustus Waters. A speaker of metaphors, Augustus Waters manages to charm both Hazel Grace and the readers within only a few pages. While Hazel and Augustus are the primary characters in Green’s book, I feel there is another important character who needs mentioning. Isaac is Augustus’s best friend and attends support group with Hazel. Isaac has lost one of his eyes to a rare type of Cancer and part way through the book he has the other eye removed as well, leaving him totally blind. Between these three characters, there is a wonderful amount of wit and sarcasm as well as metaphor after metaphor (mostly from Gus). Whether it be captivating speeches about oblivion or Hazel and Augustus’s, “Okay? Okay.”, you will never turn a page of this book and find yourself bored. The way they speak and think makes them seem to real they could almost be right next to you in the room as you’re reading. Hazel and Augustus’s story is one of love, sickness, and symbolic metaphors. You will laugh, cry, laugh some more, and cry some more while reading this brilliant novel. John Green has outdone himself by combining witty dialogue with memorable characters. There are so many things that can be taken from this book that it’s not possible to only read it once. You can read it again and again and each time is like the first time. You will fall in love with the characters all over again; you will laugh and cry and the different things that happen to them and that they are forced to deal with. Green has truly created a masterpiece in The Fault in Our Stars and I would highly recommend this book to all lovers of literature and also recommend seeing the film as it is probably the closest book-to-movie adaptation I have ever seen. Have you read The Fault in Our Stars? What did you think of? What was your favourite line?